Thriving communities have one thing in common: they are connected. One of the best ways for communities to stay connected is for the businesses within the community to step up, become leaders and find opportunities for economic development. This can take form in a variety of ways. A business could support or fund a community cause. It could sponsor a community event. It could provide scholarships for it’s local students. The way they support isn’t as important as the support itself. Indeed, businesses have the chance to positively impact the economic development within the communities it serves. Doing so is the foundation of any thriving community. For Alpine Communications, we take our role in economic development very seriously. We support the chambers of commerce within the communities we have a presence in, either through membership or participation. One of the biggest opportunities we’ve seen to boost economic vitality is through our broadband services. When individuals have access to broadband, they create their own economic centers out of their homes. They can telecommute, study for an online degree, or even start their own businesses with only an excellent connection to the Internet. This is one of the reasons Alpine Communications has been as aggressive as possible in building and installing the broadband pipes in as many neighborhoods as possible. What we’ve seen with more access to broadband is not only individuals being able to earn money for themselves by working remotely, but also supporting businesses who want to make Iowa their homebase. We’ve seen several business relocating to our community with the reassurance that broadband will help them conduct business with a stellar and reliable connection. We see their success tied to broadband. With the installation of broadband, we’ve seen the trickle effect of it in economic development. In the last 10 years, more and more hospitals and healthcare organizations are employing remote workers for things like working on medical transcripts or augmenting their emergency room support. We’ve seen examples of many individuals in our community jump on those opportunities because they had the reliability of broadband. Broadband has also helped the Alpine Communications team firsthand. A few years ago, we were struggling to find individuals with the technical experience we needed to fill multiple roles. However, it was very important to us to hire locally. By using broadband, we were able to partner with a college in northern Wisconsin to teach these skills to interested workers. Since then, we’ve had several technicians train or increase their skill set through this program. 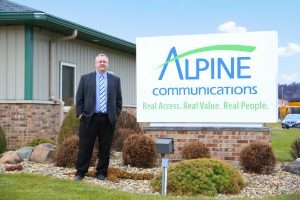 The initiative allowed individuals in the community to grow their skill sets as a broadband technician, and allowed Alpine to hire within our community. In addition to broadband, Alpine Communications has invested millions into fiber optics. We see this as our biggest role in economic development. We’re ensuring our communities are prepared for big data trends and keeping the community as economical as possible.